I’m stoked to be participating in the Sporting Life 10k run with friends on Sunday. Race proceeds are donated to Camp Oochigeas, a summer camp for kids affected by childhood cancer. 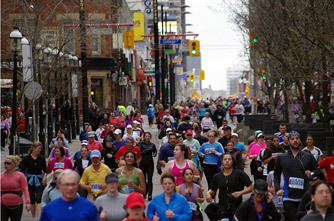 Other runners might be “racing,” but my “training” hasn’t been too speedy (and I haven’t covered much ground) so I’ll sort of be sauntering down Yonge Street to the finish line. On top of that, I haven’t run in an organized race since the 2010 Sporting Life 10k, so overall I’m a little rusty. Tinman joints aside, though, I’m excited to get some exercise, spend time with friends and, most of all, help to send a child to camp. Oh, and the beermosas at brunch will also totally be worth it! This entry was posted in Fitness and tagged camp ooch, camp oochigeas, cancer, donate, fundraise, jog, love, proceeds, race, run, running, sport, sporting life, sporting life 10k, sporting life 10k 2012, sporting life 10k run for kids with cancer, summer camp, write by lovewritenow. Bookmark the permalink.